I believe art is an inspiration for everyone. It fills the mind with imagination and the heart with wonder. Art is a form of relaxation and meditation. Being born with love for creativity as a child, I always had a desire to put my creative ideas into beautiful art. 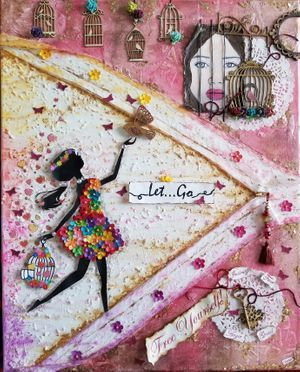 Eventually, I found a way to express my creativity using mixed mediums like paper, canvas, wood, fabrics, and metal trinkets with watercolors and acrylics. 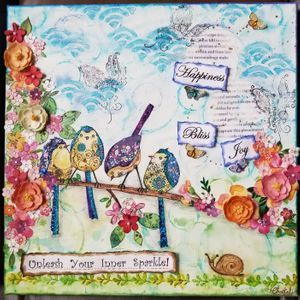 I fabricate different textures, adore stamping and inking, collaging and assembling to create my artworks. I have been teaching art and crafts for many years. Currently, I am pursuing my passion for mixed media art and conducting a variety of classes and camps for all age groups. I love creating customized artwork based on a particular theme or idea as I believe that art is a reflection of oneself! "This artwork was selected as part of the UH Art Association's Beauty in the Backyard Garden Art Competition, which produces a garden art calendar and poster."